Mark Salter and John McCain: What’s it like to co-write a book? What’s the Process for Co-Writing a Book With Sen. John McCain? 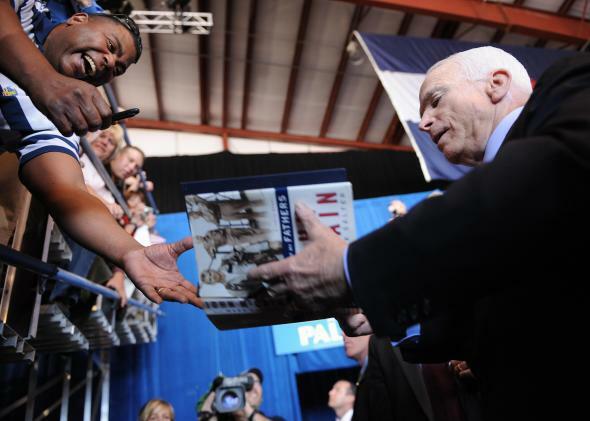 Sen. John McCain returns a book he autographed to a supporter at a campaign event in Colorado in 2008. Working with Mark Salter has varied a little from the first book to our sixth, but it’s basically the same process. Mark and I discuss and agree on the outline of the book, the subjects we want to write about, the points we want to make, and the message we hope it will convey. When the subject has been my own life and career in the military and in politics, Mark has interviewed me at great length, hours and hours and hours of interviews after work. He would write a rough draft of a chapter and send it to me to read and make comments, corrections, and suggestions. Then he would rewrite it and return it again to me for any additional changes. When we finished the first draft of the book, we would go through it together face to face at least once, and sometimes more than once before sending to Jon Karp for editing. When the subject has been other people’s lives, we discussed and agreed on the subjects and outline and the message or messages of the book. Then Mark does most of the research, while I frequently send him things I’ve read or want to use in the book. Then we go through the draft together and agree on changes. We worked in the same office for the first five books and would spend time after work collaborating on the book face to face. Now, since Mark no longer works in the office and spends much of his time away from Washington, we do more back and forth on the phone. We still meet pretty regularly when we’re both in town and talk at least once a week, but it’s not a daily experience as it once was. I don’t think that’s affected Thirteen Soldiers, but we’ll let the readers be the judge. John McCain: What is it like to be a prisoner of war? Book Writing: What are some genuine realities about book writing? John McCain: What inspired John McCain to write Thirteen Soldiers?